Restorative dentistry and oral surgery are based on helping patients to recover full functionality and restore the mouth after decay and damage have compromised a person’s oral health and quality of life. It’s unfortunate that over time, decay and diseases can rot away not only teeth, but parts of the bone surrounding the tooth, the bone in the jawbone holding the teeth in the mouth. Dentists often find out about this decay using x-ray technologies that show what’s going on under the gumline. The process is called bone grafting, and there’s a lot of progress happening around this type of oral surgery procedure. At Advanced Family Dentistry, we are excited about helping patients to benefit from the newest cutting-edge technology and techniques in the dental world. Bone grafting in a dental setting is often done in order to accommodate dental implants. 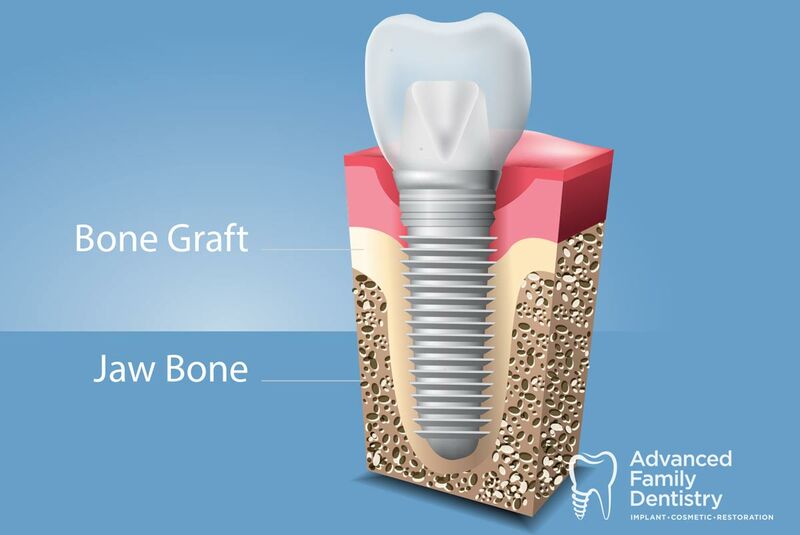 Dental implants are a relatively new type of technology where dentists can implant a permanent, durable replacement for a missing tooth, or multiple missing teeth, by directly fastening an implant into the jawbone. One problem is where there isn’t enough bone structure to accomplish the dental implant. That’s a situation where oral surgery professionals will perform a bone graft before installing the implant in the mouth. Common types of bone grafting include the Alveolar Ridge Preservation Graft, also sometimes called a “socket graft” and an Autogenous Ramus/Chin Graft referred to as a “block bone graft,” and also the sinus lift or sinus augmentation procedure, where bone is placed in the sinus cavity to broaden the bone foundation on which the dental implant will be installed. Do I Need a Bone Graft? Every patient is different, and here at Advanced Family Dentistry, we take care to consult on a personal individualized basis. What’s right for one patient will not necessarily be right for another. If you have one or more missing teeth and bone loss as a result of periodontal disease, you may be a good candidate for bone grafting procedures. Come in and talk to Advanced Family Dentistry and let us help you to plan an overall roadmap toward better oral health. We’re happy to be able to help patients to understand the best treatments for their particular needs. Talk about your desired outcomes in a relaxing environment and get on the path toward better health today. Your dental care is important to us. Please contact us for a consultation or for more information about our specialties and treatment options.